This morning we drove south from Tiberias through the Jordan Valley. At Abel-meholah, possibly the home of Elisha the prophet (1 Kings 19:16), we saw about a dozen or more camels on the hillside. I was impressed with this group of seven that stayed together apart from the others. 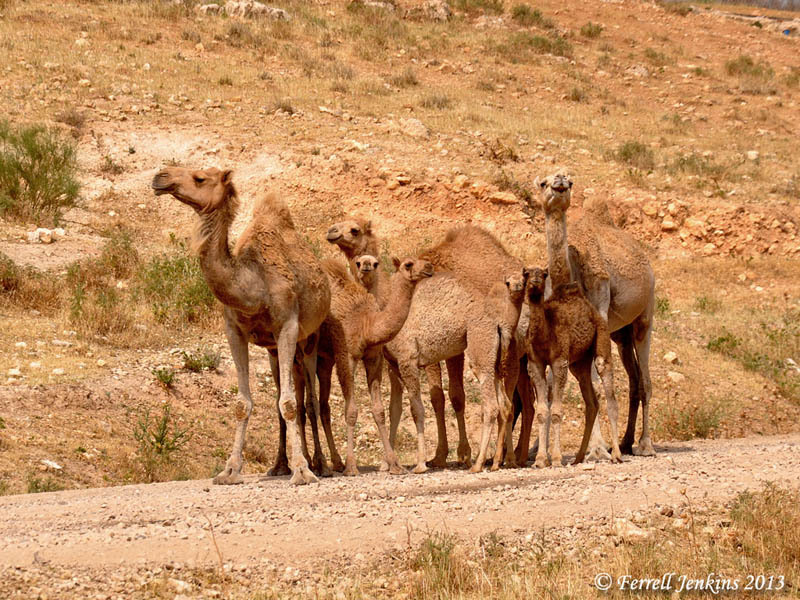 Camels at Abel-meholah in the Jordan Valley. Photo by Ferrell Jenkins. Camels are first mentioned in the Bible in the time of Abraham (Genesis 12:16). Tonight we are at Mitzpe Ramon, a little town that overlooks the Maktesh Ramon. This Maktesh, the largest on the face of the earth, is located about 50 miles south of Beersheba in the Negev wilderness of Israel.